Our time in the Tuamotus, for me, was educational. We were fortunate to be able to learn a few necessary lessons under more-or-less non-hazardous conditions. The Tuamotus Archipelago is constituted of a hundred or so atolls – raised barrier reefs in a ring-shape with a lagoon in the middle. Some of the atolls are large (the average is about 20 miles by 9 miles) and have a pass through the reef that is wide and deep enough to allow the passage of a yacht. Wicked currents generally tear through these passes, and they are difficult to predict due to the sparsity of tide stations and the complexity of other influencing factors, such as the strength and direction of the winds, how long they have been blowing, the phase of the moon, the prevailing swell direction due to something that might have happened last week a thousand miles away and whether or not Neptune has woken up on the wrong side of the bed with a hangover. In a worst-case scenario a strong current opposes a large swell. This sets up large, steep standing waves which are hazardous enough to broach a large yacht. We read one account of a 60-something-foot yacht which had their cockpit filled twice while negotiating the pass at Hao. In our case, a slight misjudgment on my part led to a bumpy ride out of Hao but nothing dangerous. Lesson learned. Another lesson was learned when we were caught out on the lee side of Amanu lagoon when the wind picked up to an un-forecast 25 knots. The fetch across the lagoon was 5 miles, which was sufficient to produce some sizable chop. To make matters worse, anchoring inside the lagoons of the Tuamotus usually involves anchoring amidst towering coral heads which snag and entangle your anchor chain. This was the case with us; the rocks had entangled the first 150-feet of our 300-foot scope. The only reason the other 150-feet wasn’t tangled up too is that we had by this point learned to suspend the last hundred feet or so of chain with buoys (if any sailors out there want to know more about this technique let me know and I’ll write a bit more). This helps to protect the coral as well as guaranteeing that you you will always have some scope, and the buoys help to absorb some of the shock loading, in conjunction with a good, long, stretchy snubber line. We spent about 12 hours anchored like this, unable to raise our anchor due to entanglement, unable to let out any more scope because we had it all out already (the water depth was 80′) and with Bob’s bow occasionally burying in the waves. No harm done. We’re ready to head back down there in a couple of months and begin our Tuamotus exploration much better equipped than we might have been. The passage back North to Marquesas was good, though we were close reaching or close-hauled for all bar the last 6 hours of it. We also encountered violent squalls, but were able to see them coming in advance and shorten sail accordingly. We pulled in to Taiohae Bay, on the South Coast of Huku Hiva, at 9pm local time on December 31st. It was a very dark night as we came in. We dropped anchor behind a catamaran that we could just make out by the glow of her decks as they shone by the light of her mast-head anchor light. I had a rum, Sarah had a glass of wine (well, maybe more than one) and we turned in for a much-needed sleep. The following morning we discovered that the catamaran anchored next to us was none other than our very good friends aboard El Nido, whom we had last seen in the Gambier Islands. Olivia and David are cruising with their two daughters, Gaya and Kali, who are 5 and 7 years old respectively. 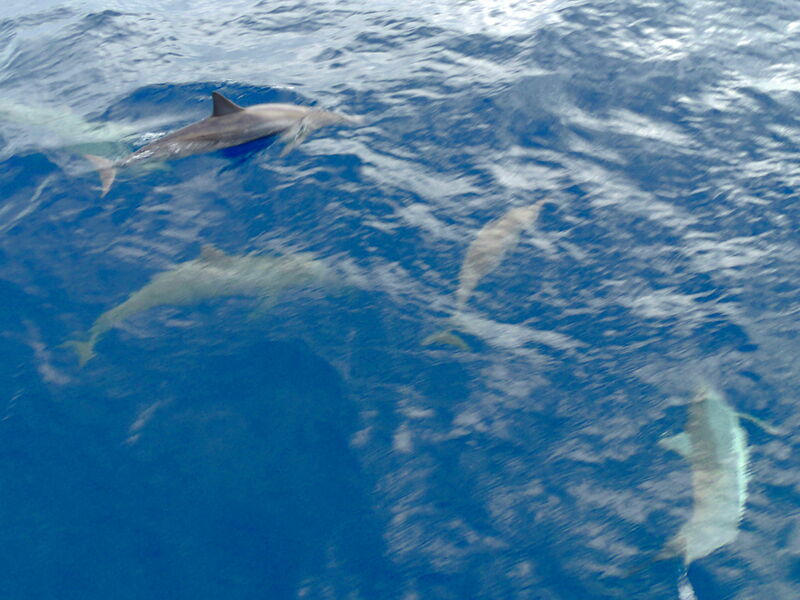 We had shared many wonderful days with them in the Gambier Islands and were exceptionally pleased to see them again. One month later, the vein of those wonderful days has continued, and we have come to regard the whole family as very special friends. I think many people would be surprised to learn of the number of cruisers who are travelling as a family. Home-schooling means that the children do not miss out on their education in the slightest. Quite the opposite in fact – the opportunity for them meet so many children from different cultures, backgrounds and economic situations adds hugely to their personal development, and makes for incredibly well-rounded, precocious children who, in my opinion, get a head-start in life compared to the vast majority of their peers. Very few boats have teenagers on board because their requirements are somewhat different, but children in the age range of between about 2 and 11 seem to be well-suited to a cruising lifestyle. At least, that seems to be the case based on the families that we have met thus far. Our anchor chain has a wealth of growth on it from being submerged in the water column for so long. Sarah has finished her statistical paper, and I have finished my project (more in the next blog post about this). We’re tentatively booked to haul Bob out for a bottom job in Hiva Oa in about two weeks and would like to make a stop in Ua Huka before then, so we’re planning on raising anchor at some time in the next few days and going for a sail. We’re looking forward to it. Honestly though, the idea of having Charline come to visit was a wonderful thought, not just because it would be lovely to see her and escape to some extent from the sailing world, but also because it would be nice for me to give Charline a fun, unusual and worthwhile experience. I am thrilled that she came all the way to French Polynesia to hang out with us for six weeks and indulge my cravings to talk about everything relating to England, my old work, dear friends and colleagues and topics of conversation that diverted from the usual subject of sailing. After fighting the weather to get from Gambier to the Marquesas Islands, Alex and I made it to Hiva Oa in the nick of time for Charline’s arrival. Our first day with her was very special and we spent our time doing a treasure hunt that our friend Marc had set up for us. It was this treasure hunt that gave me the inspiration for Alex’s Christmas gift which I wrote about in my last blog post. 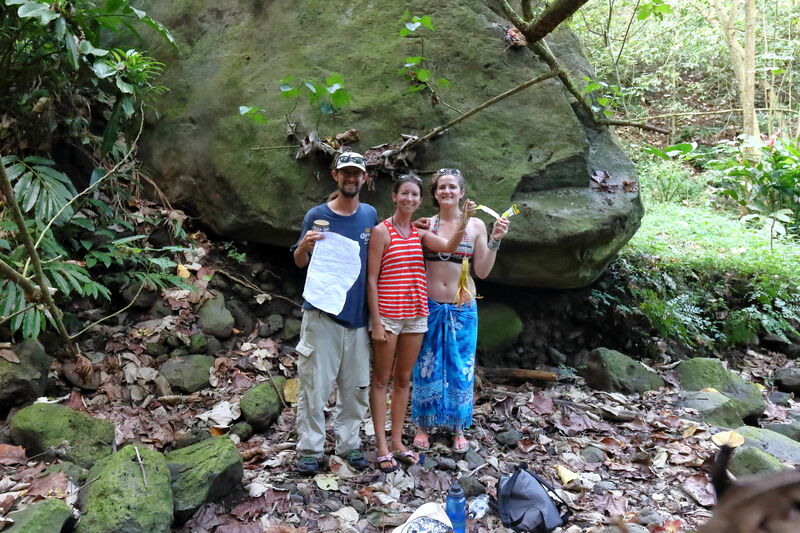 Marc had set up the treasure hunt to lead us through jungle and across rivers, concluding the hunt at a historical site with large rocks and carved ancient Petroglyphs. As with any treasure hunt, we had to find a number of stopping points, each one with some treasure and a clue to the next point. 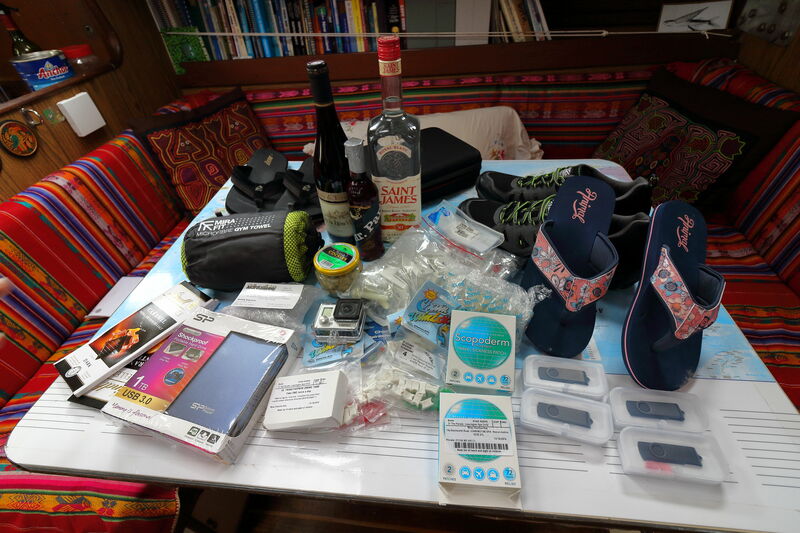 We got rum, chocolates, pasta sauce and fishing lures, but of course the true gift was the treasure hunt itself and the fun it generated. What a wonderful thing for Marc to do for us. It was also a great opportunity for Alex and Charline to get to know each other, and for me to chat to a familiar face about aspects of my old life, which I often miss. We spent a few days in Hiva Oa before heading to another island called Tahuata for a few days, where we explored the village and went for a few swims and snorkels. 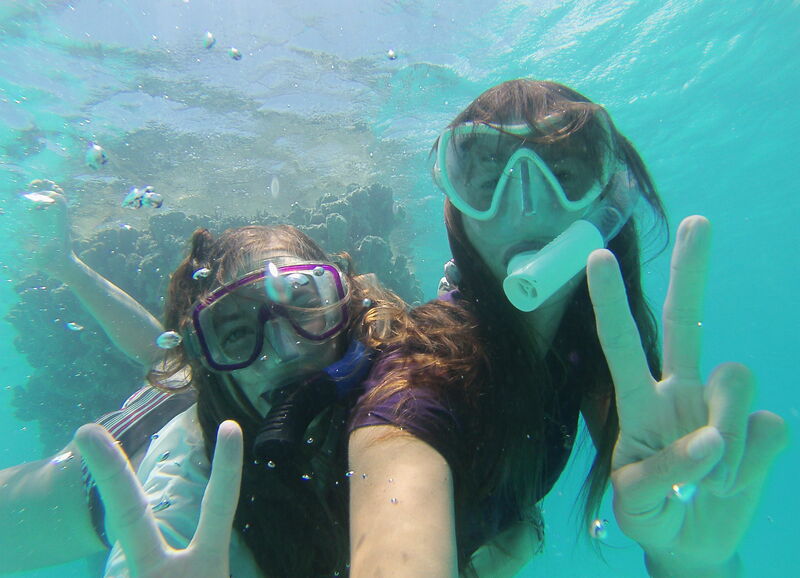 It was good fun, one of the best places to snorkel in Marquesas as it’s one of the few bays with clear(ish) water. We saw lots of fish and rays – including a pair of sting rays who appeared to be mating. Charline got a little sea sick at first but to be fair, the anchorages in Marquesas can be uncomfortable and she got over it very quickly. She rapidly got used to life on board Bob – sleeping on a berth the size of a coffin, washing up in a bucket of salt water on deck to save our fresh water supplies, sweating in the tropical heat on board a boat with no air conditioning, etc. Of course there was also the beauty of the majestic high rise islands and the wonderful array of tropical plants and animals that go with them. The tranquillity of life on a boat, the lack of distractions and the novelty of being able to swim as you please were also part of the experience. I think, like with any lifestyle, there are good and bad points to the cruising existence and Charline got a fair taste of both. After Tahuata we headed to Nuku Hiva to meet up with Marc, who we had not seen since the Galapagos Islands in May. It was so wonderful to see an old friend (I realise that we only met him 7 months previously so in that sense he isn’t exactly ‘old’, but in regards to my cruising life, Marc is one of the oldest friends I’ve made) and thank him for our wonderful treasure hunt. We hung out with Marc a lot, going on various walks, hanging out at the local cafe or having meals together on one another’s boats. We introduced him to ‘spoons’, which is a card game much like snap, except instead of slapping your hand on the table and shouting ‘snap’ as loudly as possible, you have to grab one of the spoons provided – and of course there was always one spoon short for the number of players. The game usually ends up with one person running around the boat with all of the spoons while the other players chase and tackle that person to the floor in a desperate attempt to not be left spoonless. It was really good fun! Another reason for our visit to Nuku Hiva was for a music festival that’s held here every other year in November. The festival was an interesting mix of local Polynesian music, jazz and death metal! It was a good atmosphere and I’m happy we made it in time to join in. We inadvertently became groupies and made friends with the headlining band, although we didn’t know who they were at the time. We drew their attention when playing a game we’d recently invented which involves making a complete fool out of yourself by bending and twisting your body in such a way as to get a coconut shell the furthest distance from you without moving your feet and without putting your hands directly on the floor! It was good fun and we ended up hanging out with the band for few hours as a result. Charline and I spent some time admiring their striking arms which were covered in beautifully detailed traditional Polynesian tattoos. Alex has planned to get a Polynesian tattoo ever since his last visit to this part of the world over 13 years ago. The tattoos here are very traditional, are all unique and tell a story about the person they belong too. They really are exquisite and are designed in such a way that their beauty doesn’t change as the body ages. After seeing some of the tattoos here, and hearing what Alex would like for his own tattoo, I’m really excited for him and can’t wait to see the final result. We visited a total of 3 bays in Nuku Hiva. The first was the main town of Taiohae, where the music festival was held, and we had access to shops, cafes and internet. 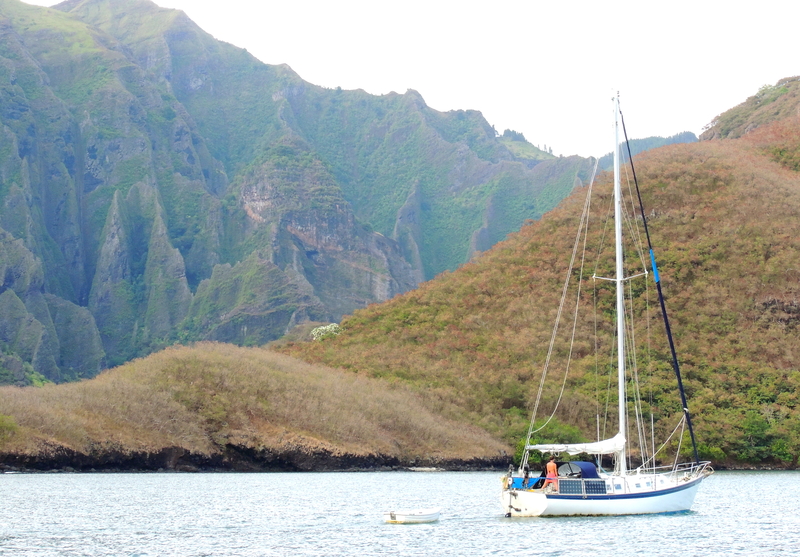 The second bay (called Hakaui Bay) was probably the best anchorage I’ve seen so far in the Marquesas Islands. Not only is it incredibly well sheltered from the sea and the wind from most directions, the surrounding landscape is very striking with lush green striated ridges, majestically carved into the sides of the mountain valley. It was in this bay where we met some friendly locals tendering their land who were also pleased to be in our company for an hour or two. We met a lovely elderly couple who, for a very reasonable price of $10 per person, cooked us up a delicious lunchtime feast of 8 different local Marquesian dishes using local fish, chicken, bananas, coconuts, papayas and much more. We also had drinks with a young man who owned land and a house which, he claimed, used to belong to his ancestors who back in the day, were Polynesian royalty. He was only 26 years old but lived in the house by himself after his family died and left him the property. One of his possessions, which led to a number of interesting conversations, were the two human skulls he had in his hallway. The Polynesians have a long history of cannibalism, and whilst this tradition is no longer supported or practiced, this particular bay has a bad reputation owing to one crazy individual about 4 years ago who murdered and cannibalised a passing sailor. Although we are perfectly safe and the murderer is now in prison, the sight of the skulls sent a worrying chill down my spine. Four years is not a long time, I thought, maybe the guy who lives here was friends with the cannibal man and also had a taste for human flesh. I’m just being paranoid, I kept saying to myself, there’s nothing to fear! In the end, I really needn’t have worried; the man was harmless and very welcoming. He explained that the skulls came from a nearby cave where his royal ancestors were laid to rest, but that a recent storm had caused the skulls to fall from the cave and land on the forest floor. Rather than leaving them on the floor to be buried and forgotten, he took them back to his home and created a kind of alter for them. It was a very interesting place with a spooky historic atmosphere, but it didn’t put me off. If anything, it intrigued me even more and I would recommend anyone staying in Nuku Hiva to stop for a visit. We also spent a good day hiking in the forest to reach a waterfall about 2 hours inland through the valley. Unfortunately, due to the risk of landslides we couldn’t make it all the way, which was disappointing to say the least. One of the main reasons I wanted to do this hike was to swim in a serene fresh water pool at the foot of a cascading waterfall. The hike was enjoyable nonetheless and we still got a good view of the waterfall itself – one of the longest on the island. The forest was a wonderful environment to hike in and given my background in ecology, forestry in particular, it felt somewhat familiar. We past numerous historical features and got a sense of how ancient Polynesian settlers might have lived here, seeing their lives through remnants of old roads, walls and buildings still discreetly situated in the forest. We had lunch next to the river where a number of juvenile fresh water eels had become habituated to human presence. The eels were huge! Probably about 4 feet long and the width of a marrow, they sat there looking at us whilst we ate our lunch waiting for some titbits – not too dissimilar from puppy dogs in that respect. We were happy to feed them a crumb or two, but as friendly as they were we still decided they looked far too menacing to swim with. Reluctantly, we decided to head further downstream before we took a dip to cool off. After our time in Hakaui Bay, we attempted to visit Ua Huka, an island to the east of Nuku Hiva with a population of only 600 people. Unfortunately, the wind wasn’t in our favour and there was the added issue of mine and Charline’s sea sickness. I still can’t believe that after all this time I still get sea sick, and this particular trip was the worst yet! We got up at 6am, pulled up anchor and left by 6.05am. I was still half asleep, completely disoriented and no breakfast in my belly to stabilise its lurching. To think I managed an entire 23 days at sea on the voyage to Pitcairn without throwing up – this time I managed just 23 minutes before I was blowing chunks over the stern of the boat. Charline followed suit about half an hour later. 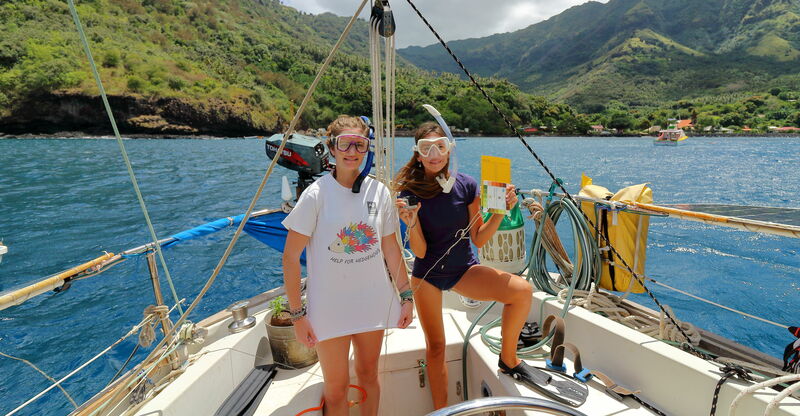 With this unfortunate turn of events, we made our way to Baie Du Controleur, a few miles east on the southern coast of Nuku Hiva and anchored there for a few days. 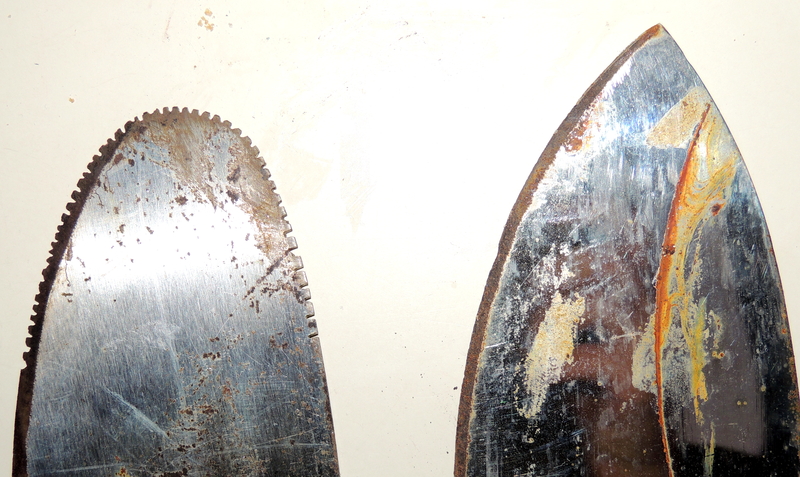 Here we relaxed, explored the local village, did some swimming and converted a machete into a coconut grater. I also made sure to take note that in future, I need to get up at least half an hour before setting sail, drink coffee and eat something to avoid any future sea sickness disasters! Charline is having far too much fun with that coconut grater! After a short stay in Baie Du Controleur we set sail once again, this time for Ua Pou. Ua Pou is an island with a truly spectacular and dramatic landscape. A number of tall phallic outcrops project from the island into the clouds above, comparable with towers of a haunted castle from a fairytale – their summits fading into the misty world above. The bay itself is quite exposed, although there is a small breakwater with enough room behind it to shelter 3 or 4 yachts. We managed to just about squeeze in between two boats with the use of our stern anchor and with the help of a fellow sailor called Daniel. Daniel is a lone sailor from France who is another wonderful guy and typifies the sailing community in his welcoming, helpful and friendly attitude. 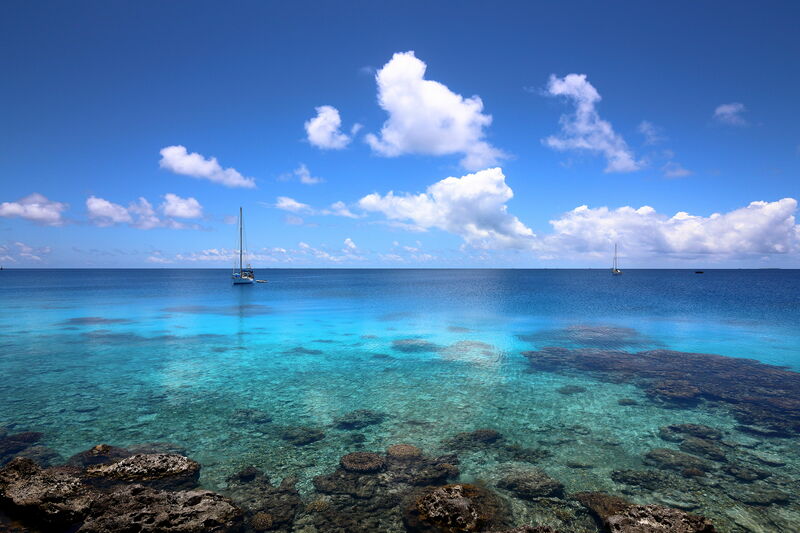 We spent most of our time in Ua Pou preparing for a long sea journey to Hao in the Tuamotus. We stocked up on tinned, dried and fresh food, replenished our petrol stores, got more gas for the cooker, cleaned the hull, made meals for the journey, filled the water tanks, did the laundry, changed the headsail and so on. We managed to squeeze in a little sightseeing too; we walked over the ridge to another bay, explored the village, had an excursion along the exposed rocky shore outside, swam and had fun jumping off the high dock. When the time came we headed out to sea, making our way to Hao in the Tuamotus feeling as prepared as we could possibly be. The hull was nice and clean allowing Bob to glide through the water as best she could, the weather was forecast to be a relatively easy beam reach and I was drugged to the eyeballs with Scopoderm and prepared to punch my sea sickness in the face! Knowing that Alex was apprehensive about the trip to Hao I was keen that he enjoyed the journey as best he could and got enough rest as to not find things too stressful. The weather gods did their best to thwart this plan for me on the first night. The entire night was filled with lulls in the wind followed by violent squalls – the likes of which Alex had always made sail adjustments for in the past. For the first time I started adjusting the sails myself, reducing the genoa in anticipation of an approaching squall or letting out the main sheet and going downwind to reduce pressure in the sails. I have no idea whatsoever if I was doing the right thing, but the boat seemed stable, not overpowered and we were heading vaguely in the right direction – so it can’t have been too bad. At least Alex could get some rest and I found that it improved my confidence a lot. In the end this was the only arduous night and the rest of the voyage was a pleasure. 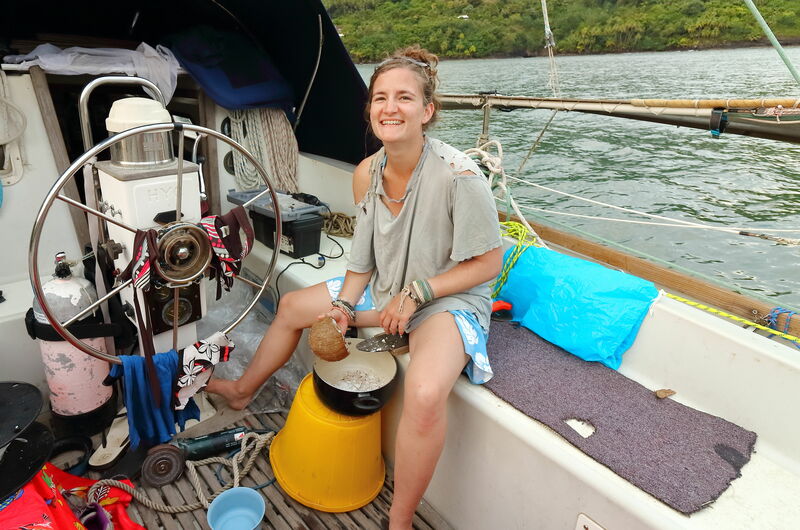 Charline did a great job as well, despite feeling very sea sick (even with a Scopoderm patch) she still sat each watch without complaining and helped to wash up and prepare meals as best she could. She seemed to really enjoy the night time watches, counting how many shooting stars she could see and admiring the glowing green phosphorescence in the water. I remember feeling the same way when sailing was new to me – when the beauty of the starry night sky, unspoilt by light pollution, was an uncommon sight to my amateur eyes. Nowadays, there are still moments when the stars absolutely take my breath away, but unfortunately, tiredness overcomes me pretty quickly and even the splendour of the Milky Way cannot diminish the longing for my bed. 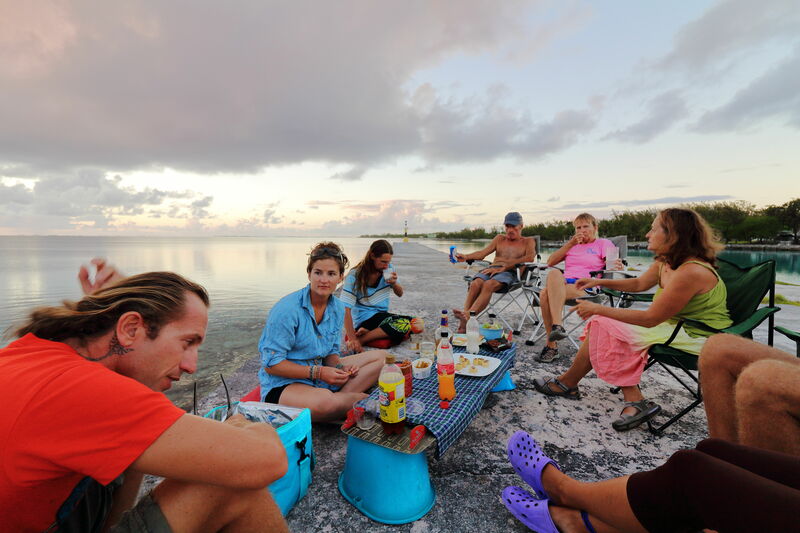 We arrived in Hao on day 5 ready to enter the pass of the atoll and into the lagoon. Hao, like many of the atolls in the Tuamotus, is a low-lying ring-shaped coral reef with various islands and motus, some of which have been utilised for civilisation. The atolls are usually formed atop the rim of an extinct volcano or seamount which, over time, has eroded or become submerged, resulting in coral reefs with small stretches of land. Have a look at the satellite images on Google Maps to see what I mean! From what we have seen of the Tuamotus – they are serene, low-lying land masses with a lagoon in the middle and wonderfully clear waters and reef systems which are perfect for snorkelling. In Hao, it’s possible to anchor in the middle of the lagoon – but in order to do so you have to sail through a pass which most of the time has a very strong current surging through it. In order to pass safely, a boat should enter when the tides on the inside and outside of the lagoon are equal, known as ‘slack water’. The tides are influenced by so many different factors that it’s very difficult to estimate the time of slack water in advance. Luckily, it’s easy to gauge how safe the pass will be from simply looking at the movement of the water and assessing the current. In our case, thanks to the wonders of our Satelitte Phone, we were able to receive emails from people who had found the slack water times for Hao by researching it online. Despite our anticipation and anxiety of entering the pass, we did so without any problems. During our stay in the Tuamotus we went in and out of two passes, which might not sound like much but it’s all good experience for when we visit more of these atolls later in the year. I really enjoyed visiting Hao. The locals are incredibly friendly, and I know I say this about most of the places we’ve visited so far, but this is probably the friendliest place we’ve been to so far in French Polynesia. The landscape is very tranquil and unique. You can walk from the protected inside-edge of the lagoon to the exposed outside-edge in just a few minutes. Even though the two coastlines are so close to each other, it feels like passing though a wormhole into a completely different location as the shoreline habitats are so vastly different from one another. The protected coral reefs inside the lagoon are wonderful places to snorkel and Charline and I had a lot of fun using my new GoPro and doing fish and coral surveys. This is an unusual time of year to be in the Tuamotus as most people have retreated to safer areas, so we expected to be anchored alone here. Amazingly, there were another three boats already in Hao when we arrived – all three of them were on their way to the Gambier Islands to spend the rest of the cyclone season there. Better yet, all three of them spoke English as either their mother tongue, or at least their preferred language over French). It had been almost two months since we met such people and it was lovely to hear English being spoken so naturally and in such a multitude of different accents (Scottish, American, Australian, Croatian and Swiss). Charline and I spent lots of time chatting whilst shell hunting on the beaches and exploring miles of atoll. We had sunset drinks with the other sailors and even got the opportunity to go wake boarding thanks to the generosity of the owners of a boat called Ednbal. They own a wakeboard and had the patience to show us how to use it. 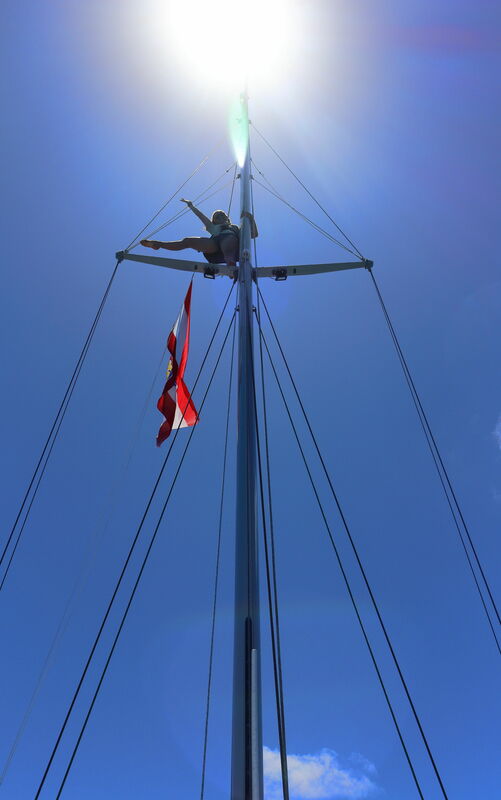 We even sent Charline up the mast, just for fun of course, no mast work required on that particular occasion. It was here where Charline left us to fly back to the UK on the 14th December. She was to continue her action packed adventure by camping in the Lake District (in the middle of December I might add and after 6 weeks in the tropics), followed by Christmas with her folks in Normandy then New Years Eve in Ireland. We helped her carry her bags the 4 mile journey to the airport, but after a short walk she managed to hitch a ride, so we quickly said our goodbyes. Looking back on that moment, her departure seemed far too sudden and hasty. One minute she was there, the next she was gone, leaving us in a cloud of dust on the side of the road. Back at the boat everything seemed eerily quiet, her presence definitely stayed with us for a while after she left. Of course there are challenges involved when 3 people live within such close quarters, but it was so nice to have her on board and I missed her almost immediately. I’m so glad I could enjoy Charline’s company for those 6 weeks, to chat with a familiar face about all the memories of my old life, to discuss jobs, dreams, boys and life in general. Our experience definitely brought us closer as friends and I hope that Charline had a wonderful experience and treasured memories to take back with her.